Bisexual men are sharing their experience more than ever before on YouTube. This is a great thing. Years ago when I was coming to terms with being a bisexual man, it was hard to find any good material by bi men on the internet. I did read a couple of excellent blogs written by bisexual men back then, but there were very few bisexual guys writing about their lives, and no vlogs at all. Engaging with the experience of other bisexual people is a really crucial part of the process of becoming comfortable with your sexuality. YouTube videos are a wonderfully direct and intimate way of doing this. Check out Jake’s powerful coming out video. He expresses really well how difficult it is to form a bisexual identity in a culture which often doesn’t recognise bisexuality. His reflections on the complexities of coming out are also very helpful. Mason’s moving coming out video goes into depth on the challenges of realising that you’re bisexual during your school years, and the difficulty of coming out to partners and family. Mason’s message is positive and inspiring. Check out Kenny’s really helpful video detailing his experience of growing up bisexual. As Kenny says, he’s learned not to worry about his sexuality and to feel comfortable with his attractions, irrespective of gender. 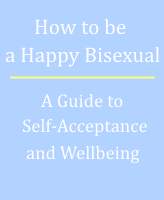 Get my ‘3 Steps To Bisexual Wellbeing’ guide now by entering your email address below. You’ll also be on the list for my newsletter which features tips and information on bisexuality and wellbeing.